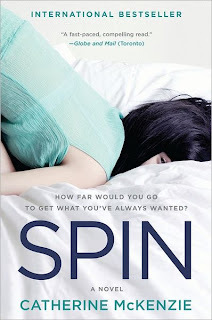 "Spin" by Catherine McKenzie ~ I loved it! "Spin" is a case of madcap mistakes and mishaps with a bit of misery thrown in. It's one of the funniest books I've read this season. It's also one of the most surprising. It's difficult to catch me off guard, but along with the protagonist, Katie, that irrepressible 30 year old, wanna-be 20ish-something girl trying to live her dream, I found myself in denial nearly to the end of this book! This is a story that will keep you up all night reading and relating. Katie is a simply irresistible character. As Catherine McKenzie has drawn her, she's a happy drunk and the kind of friend you call when you want to have a good time. She's also the kind of friend who won't deny you much of anything you ask her for. This combination, mixed with Katie's lack of a true family anchor and belief in herself, are lethal. She tries to give herself some sort of base to feel good about in her grasp of music and her goal of writing for a "Rolling Stones" type of magazine. Generally, these goals are illusive in light of her sense of failure. I love Ms McKenzie's beginning characterization of a young woman caught in a web of disillusionment. Katie knows she's spiraling out of control, but she's not sure how to stop it. The beautiful thing about McKenzie's portrait initially is that we see and are drawn in to Katie's strong sense of denial. Though we love Katie from the first introduction of her, we see it's going to be a sad commentary on a young woman who can't stop drinking long enough to grow up and face her demons. In my case, I loved Katie so much, I was sure she'd realize the drinking was holding her back and she'd quit as soon as she got her assignment! I found myself following her in denial. What a perfect place for a writer to take me! Genius! When Katie finds herself on assignment for "Gossip Central" to get a scoop in rehab. on the famous actress of a highly touted prime time tv show, she's as caught off guard as we are to find that she might be in need of some rehab. herself! It's through her experiences befriending this young girl, the rehab's somewhat ridiculous therapist, a gorgeous "handler" of the actresses boyfriend, and some hilarious group therapy that we all get a sharper perspective. As Katie's understanding of herself develops, so does ours. This is some powerful writing. I thought this was also a perfectly paced book. It had moments of enlightenment, and moments when I was so drawn down with Katie into her denial that I was sure everything was all right with her, and that the rest of the people, including the staff at Cloudspin Oasis, were cracked! It was beguiling, breathtaking in its truth-telling of alcohol and drug dependency's grip on people. I found myself laughing out loud at one point, and cringing with shared shame and sympathy a few minutes later. The mood swings- - spins of this novel are incredible and meaningful. So are the roads to healing. "Spin" is one of the most clear and honest stories of the human condition of addiction, its repercussions, and its outcomes I've ever read. Its right up there with "Clean and Sober." Heart-warming and hilarious. This is a book that will have you spinning with sickness, love and laughter. You just have to read this book! In addition to the book's story, Ms McKenzie has included a playlist of Katie's at the end of the book that will just floor you. So cool you'll be writing it down to download it! Watch this video interview in which Catherine answers some inside information about "Spin." She talks about how she wanted to write a sort of comedy, how it's been opted for a movie, and how she likes to include pop art information and music in association with her books. A very interesting young writer! Sounds like an important story! This sounds good. I'm going to send a sample to my Nook. Thanks.